Today I spied with my little eye a cute girl enjoying her new light in the reading nook! We hope to be working on more of the house soon so that we can show you more updates!!! Make today a great one! I must say that I.LOVE.GALLERY.WALLS. I think the reason why I love them so much, is because it is a collection of items and pictures that are close and meaningful to the household. THE STEPHENSON SPEC HOME IS ALMOST FINISHED! Well the STEPHENSON SPEC HOME is coming along!! I gotta say- it is HARD work to design an ENTIRE house 4 hours away via text message and face time!! But It is really fun watching all of my designs come together! I got to go check it out in person a couple weeks ago and make sure it was all coming together the way it was supposed to! Only a few more weeks left and this baby will be finished!!! If you are looking for a great home in Sunny Saint George Utah, this could be what you are looking for! Check back for a blog post about the whole design once it is completely finished! Don’t quit your daydream! If I did, I wouldn’t be making a living doing what I love: Organizing and Interior Decorating! These two things are my love languages! 😉If I am ever off in a daze, my mind is most likely creating or organizing/designing. I have been told all my life that I have an eye for this and that I need to do it for a living. So here I am, making my dreams a reality!! I am so happy I can help others while I do what I enjoy in life!! Amanda, I had a great time this morning doing a consultation with you!! 😘 Can’t wait to see the final result!! If you are in need of a professional organizer or decorator- let me know! Have a great day!! Welcome to the second half of remodeling our home! Take a seat and relax! I can’t wait to show you what we have done to our place called home! 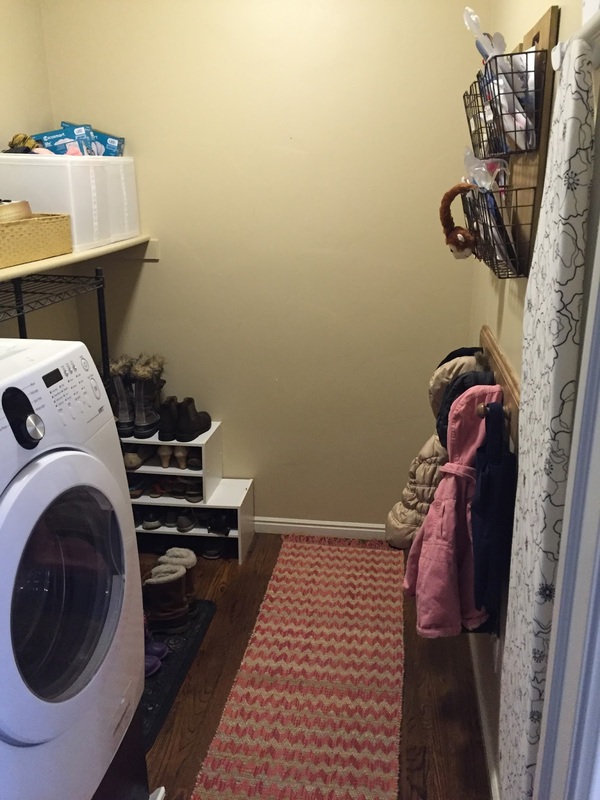 As you have seen in previous posts, our “laundry room” has been in the process of turning into our MUDROOM! YAY!!! But it has been a.ton.of.work. After plugging all the previous laundry water lines and electrical and adding the shiplap to the wall, it was time to remove the wood flooring and add some sweet tile. Next up was adding the new tile and expanding the entryway! Since this space was no longer a laundry room with loud washers and dryers, I added into my design plan to remove the door to the space. We simply removed the door and then took off the casing and door frame. After looking at the entryway with all of them removed, I decide I wanted to also remove a few 2×4’s as well to make the opening even bigger! Once those were taken out, we added new drywall and mudded it all up! I LOVE not having a door to this space because there are so many doors already in this little nook! Now we can come in from the garage and walk STRAIGHT into the mudroom to put away our things and shoes without any doors in our way! The New Mudroom: PART 1 -AKA- the day we realized we need a reality TV show.. I would like to introduce to you my “laundry room”. Where is the dryer you ask??? Oh… it is in the basement.. The home doesn’t have Gas in this room (which my dryer only uses) so we had to make do like this for several months.